It may have taken a while but at last, the most recent episode of ABC's hospital drama, Grey's Anatomy (now in it's fifth season), reminded me why I watch this show. In the last two years or so, the show seemed to have turned it's back from the amazing writing of the first two seasons and although there have defiantly been some standout episodes since, no thanks to the WGA strike last year, Season Five has most certainly got the wheels back on the track. After a touch and go storyline of the return of Denny in the life of Izzie Stevens, many viewers (long term Grey's lovers and newbies) thought that this may just be a cop out for the writers while they try and think of some respectible storylines although we have come out at the other end learning more about each of the characters and how each of them reacts when one of their own is in danger. Justin Chambers and T.R. Knight showed sides to their characters, be it love or anger, that we have not previously seen and they excelled in this classic episode. As both Alex and George learnt, it's best to have your people around. Despite what anyone says, in my personal opinion, there is two main things about Grey's Anatomy which puts it in the top shows around at the moment, the acting and the writing. Shonda Rhimes and her team of writers always, despite the story, manage to capture the exact emotion needed and are able to put into the most beautiful words how the characters feel. I think, you always know when you are watching something by this talented group of writers, there is a repetitive sense of honesty that comes out from each character- and it never gets boring. But the group of actors in Grey's Anatomy make the show. In this episode, Cristina Yang (Sandra Oh) gripped me from the off as she was dragged through motions after her boyfriend, Owen (Kevin McKidd), had another PTSD episode and dramatically attacked Cristina in her sleep. It's wonderful to see such stories, which are rarely shown on television, being explored. This story, I feel, has not finished and when audiences are treated the stunning scene where Cristina and Owen make love all the way to Cristina saying, "I'm in your arms and afraid to fall asleep," just showed the depth that Grey's tends to go. Television has been accused for dumbing down for a new type of audience, one's with short attention spans, one's who care very little for character development and who don't care too much for deep, important storylines which should be explored in the mainstream and yet Grey's Anatomy never fails to impress by breaking boundaries and ignoring this new audience and nurturing the fans who have been here since the beginning. And what a finale... the engagement of Meredith and Derek, delivering exactly what the name of the episode said. Looking over at the conquests, the wins, the positives for MerDer. That just leaves Izzie, left alone for the episode to start to confront her own demons while her friends do the same. The wonderful Miranda Bailey (Chandra Wilson) spinning her moral code for the rest of the characters : "She need's no more doctors, if you are going in there, you are going in as her friends." So this episode will go down as being one of the most powerful, well written, engaging episodes of Season Five and probably the show. This is the reason we watch Grey's Anatomy people... it looks like there is a light ahead. The next episode returns on April 23rd entitled, Sweet Surrender and with only five episodes left till the end of Season Five it looks as if Grey's could return to it's former glory in hospital television heaven! it is one of the fantastic tv show i love grey's anatomy episodes. i have all latest collection include season 5 of Grey's Anatomy. i had watch it previous saturday. it was fantastic. But i think Grey's Anatomy Season 4 episodes are better than Grey's Anatomy season 5 Episodes now i m waiting for complete udations of Grey's Anatomy Season 6 Episodes. when it will completed i will also download season 6 to watch with my girl firend. season 5 was the best season of the Grey's Anatomy TV show. i just loved it. right now i am into its 6th season and all the episodes so far are great. I always Watch Grey’s Anatomy TV Show online. This is one of the best show. Its story is well written and I like it very much. Cast is also superb. Thanks for sharing this blog here. 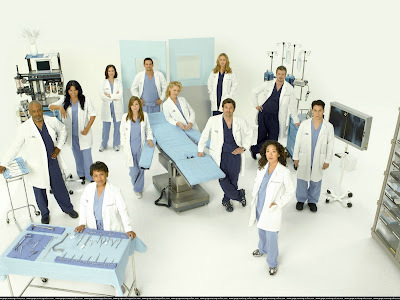 Season 5 of Grey’s Anatomy TV Show has 24 episodes and all episodes are very very nice to watch. I have seen this episode too. I just like this show very much.